Those of the world serve God in the outward appearance, and He even says they love to be seen by others when they give to the poor (Give Alms) or pray. He even considers them to be hypocrites. (Matthew 6:1-6). God does not want to be worshipped this way as He is a Spirit and is to be worshipped in Spirit and in Truth. (John 4:23-24). 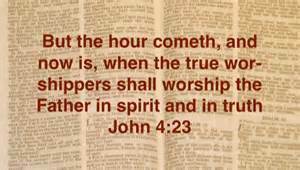 But the hour cometh, and now is, when the true worshippers shall worship the Father in spirit and in truth: for the Father seeketh such to worship him. God is a Spirit: and they that worship him must worship him in spirit and in truth. Scripture tells us it is easy to see who is truly serious in serving God, for those of the world speak mostly of this world while His servant’s speak of the world to come and of Christ their Saviour. We are not to believe every spirit but try them to see if they believe Christ came in the flesh. (1 John 1:1-6). Jesus knew how His people would be treated as they stood for His message and plainly says as He was hated so will we be! We have a Spirit that is not of this world, but of the one to come and the natural (Not spirit born) man cannot and will not understand that which is spiritually discerned. (1 Corinthians 2:11-16). For what man knoweth the things of a man, save the spirit of man which is in him? even so the things of God knoweth no man, but the Spirit of God.Now we have received, not the spirit of the world, but the spirit which is of God; that we might know the things that are freely given to us of God. Which things also we speak, not in the words which man’s wisdom teacheth, but which the Holy Ghost teacheth; comparing spiritual things with spiritual. But the natural man receiveth not the things of the Spirit of God: for they are foolishness unto him: neither can he know them, because they are spiritually discerned. But he that is spiritual judgeth all things, yet he himself is judged of no man. For who hath known the mind of the Lord, that he may instruct him? but we have the mind of Christ. The longer we meditate and study the word the more spiritual things become more important than what this life offers. (Psalm 1:1-3). This is a temporary place we are passing through to get to our eternal home, and all we learn of this world will perish, but what we learn of Christ and the world to come is eternal! (1 Corinthians 6:19-20). What? know ye not that your body is the temple of the Holy Ghost which is in you, which ye have of God, and ye are not your own? For ye are bought with a price: therefore glorify God in your body, and in your spirit, which are God’s.